We are excited to announce the opening of the movie "Courageous" on Friday, September 30th. 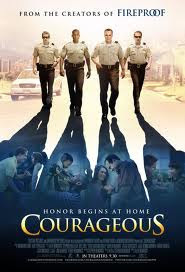 "Filled with action-packed police drama, COURAGEOUS is the fourth film from Sherwood Pictures, the moviemaking ministry of Sherwood Baptist Church in Albany, Georgia. Riveted moviegoers will once again find themselves laughing, crying, and cheering as they are challenged and inspired by everyday heroes who long to be the kinds of dads that make a lifelong impact on their children." With your help, we have the opportunity to create a positive impact on families in our community. We would like your church or organization to consider pre-purchasing movie tickets at a special group rate of $6/ticket for opening weekend Friday, September 30th – Sunday, October 2nd. For more information on group tickets, email info@leitersburgcinemas.com or call Beccy @ (301) 791-1221 X100. To make promoting the movie as easy as possible, all marketing materials (graphics, movie trailer, etc) are ready to go and the timeline below outlines the important dates to coordinate promotion and ticket sales. Tickets are only $6/each and, if interested, ticket holders may purchase a small drink and popcorn for only $3. A special coupon will be attached to each group ticket.